At a time when some banks are shrinking because of high loan default rates, Grameen America has experienced an astounding 99.5 percent loan repayment rate in its first year of business and is expanding to make even more small loans to low-income U.S. residents. Based on the capital it continues to attract, Grameen America plans to increase activities this year in New York City, where 23 percent of residents live below the poverty line, and “there are many qualified, low-income borrowers with promising business endeavors,” Grameen America President Vidar Jorgensen said. 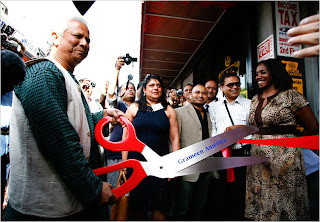 Grameen America is the first and only microfinance organization in America directed and managed by microfinance pioneer Grameen Bank, which shared the 2006 Nobel Peace Prize with founder and economist Professor Muhammad Yunus. Since its founding in Queens, NY, in January 2008, Grameen America has lent more than $1.1 million to 440 women in the borough. All are self-employed, without assets or credit ratings, and most are immigrant mothers, whom Jorgensen said are strongly motivated to improve their families’ lives. Although the loans were made only with simple receipts, 99.5 percent were repaid on time. Additionally, each borrower opened a savings account — a first for most — and together have deposited $80,000 in savings to date. Within a year, if these borrowers continue paying on time and have no adverse credit reports, they can expect a credit score of 650 or higher. “Given the world economy’s current credit woes, it is worth noting that Grameen America’s unsecured and virtually undocumented loans to poor immigrant women have performed better than the secured and heavily documented housing loans given to much wealthier individuals, who are defaulting at much higher rates,” said Jorgensen. Grameen America holds all loans it issues, and its representatives meet with borrowers in their homes before making a loan, then again face-to-face each week, to ascertain how things are going and review loan utilization and repayment obligations. By contrast, in more than half of all the U.S. housing foreclosures, lenders and borrowers had no communication in the prior 12 months, Jorgensen said. Grameen loans rest on a simple foundation: Trust among individuals from the same community. Each new client joins a group of five borrowers. While loans are the individual’s responsibility, group members help find, evaluate, monitor, and support other borrowers with similar backgrounds. If one member falls behind, no one else in that group can borrow more until everyone’s loan is current. Because all members are aware of one another’s loan status, each is motivated to “do the right thing” and repay loans on time. Worldwide, Grameen’s foundation of community-based trust has proven more dependable and more “credit worthy” than agreements supported by collateral, the implied guarantee of the U.S. government, and legal documentation used in mortgages and asset-backed securities. “Grameen America’s success in 2008 comes as many people wonder what went wrong and how to improve financial performance,” said Professor Yunus. “Only 30 minutes from the headquarters of many of the world’s largest and most sophisticated financial institutions, this simple Grameen lending operation is thriving and growing small businesses through loans averaging just $2,000. Grameen America, whose core lending operations are in Queens, is a microfinance organization dedicated to serving low-income communities throughout the United States by loaning funds, at reasonable terms, for income-producing activities. Chairman Muhammad Yunus selected Shah Newaz, a 27-year Grameen Bank veteran to lead the U.S. operation. Newaz has recruited five bilingual center managers from the largely Latino communities. Grameen America is committed to building a full self-sustaining organization that will expand across the United States to assist low-income people in building better futures for their families. Its overarching goal is to build a culture of individual responsibility, savings, and prudent use of credit for income-generating activities throughout the United States. Once a substantial base of about 10,000 borrowers and savers has been established, Grameen will add larger loans for education, sustainable health care services, and other purposes. ineligible for traditional loans and must pay exorbitant interest rates to access credit, lift themselves from destitution.